Charles Darwin once described the Galapagos Islands as ‘a little world within itself’, and it only takes a five-minute visit to realise how right he was. The islands are home to a bizarre and varied selection of wildlife and animals, such as rare tortoises, brightly coloured marine iguanas, and blue-footed boobies. Also, thanks to its volcanic activity, the lavascape contrasts dramatically with the blue waters, making it perfect for photographs. Unsurprisingly, the Galapagos Islands are the top of pretty much every travellers bucket list because of its eclectic mix of plush white sands, exotic birds, and deep lava tunnels. The unofficial animal kingdom of South America, the Islands feel like something from another world, a lost world, the likes of which won’t have been seen anywhere else in the world for hundreds of years. Quite obviously a tourist haunt, to make the most of your trip you really need to know all the best places to go – there is so much to see, it’s too easy to miss something spectacular. So, we put together a guide of how to visit the Galapagos Islands correctly, including things to do, where to see, what wildlife to look out for and more. Enjoy. There’s more to the Galapagos islands than just the giant tortoises made famous by Charles Darwin, although experiencing the incredible biodiversity should be number one on anyone’s bucket list of things to do – it’s just not the only thing to do. The Galapagos Islands are also world-famous for their coffee and chocolate, which are made differently here than anywhere else in the world. Coffee producers hand select only the best beans for each batch of coffee, which are all slow-roasted on local farms, and there’s homemade chocolate available to buy all over the islands. The Islands are also home to the Sierra Negra volcano, which can be found on Isla Isabela: the six hour, 17km trek up the mountain includes the world’s second largest volcanic caldera, which last erupted in 2005. 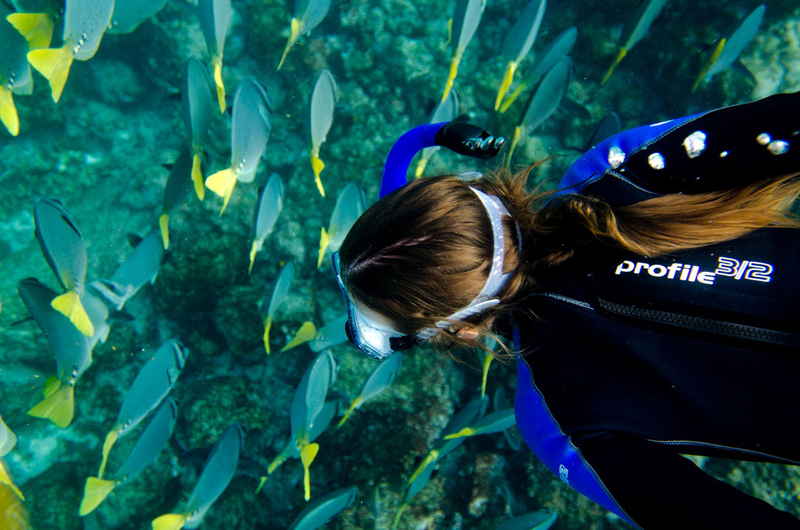 Or, if hiking isn’t really your thing, there’s tonnes of snorkelling hotspots all over the Islands where there’s even the chance to swim with shoals of manta rays and whitetip reef sharks. Booking the “best” time to go to the Galapagos Islands really depends on what you’re looking for from your trip. Technically, there isn’t a best or worst time to visit thanks to the Islands’ location on the Equator (so the weather is travel suitable all year round, if a little hot), but the most popular times to visit are between June and August, and mid-December through to mid-January. December to May is the rainy season, but the sea is relatively peaceful still, and the daily showers means that for the rest of the time the sky is pretty much cloudless – great for views of your surroundings, and for pictures. Plus, the temperature is usually above 25 degrees, so it’s definitely not cold but also not stiflingly hot, and makes it the perfect time to visit if you’re looking for clear snorkelling, colourful fauna, and hatching sea turtles. The rest of the year (June to November) is the dry season which comes with a rougher sea and cooler temperatures of around 20-25 degrees. 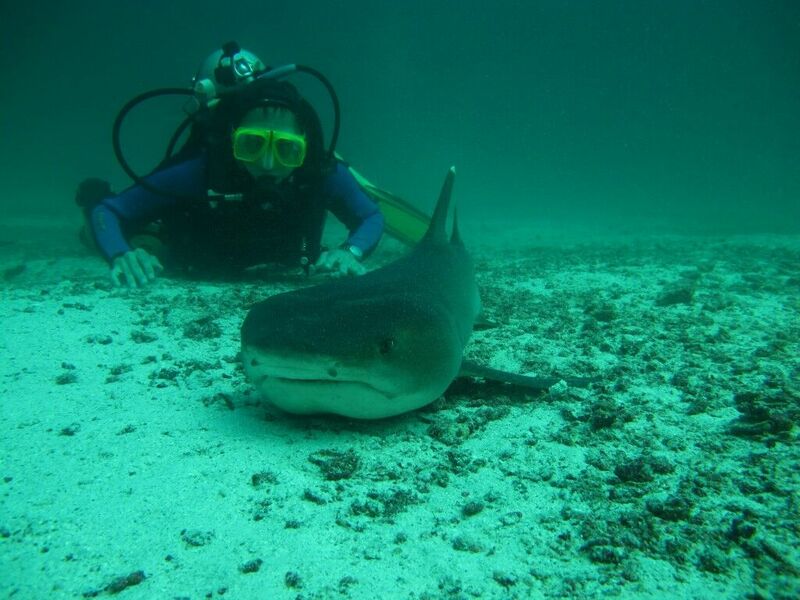 If you’re an experienced diver, then this might just be the best time to visit as the cold water attracts a wider variety of marine life – such as the hammerhead shark, or whale shark. Whale watching is technically a year round activity, but the cooler months are typically thought of as the best time to see them. It can occasionally be done by land, but more often than not it is done by boat, and guests will receive guidance from a naturalist who teaches you about what species you are seeing, and about proper whale watching techniques. One main thing to note is that it is incredibly difficult to predict exactly when and where the whales will show up; understandably, they cover a lot of water ocean in their home range, so although experienced guides will likely visit their most common grounds, they cannot definitively say that whales will be there. Approximately 24 different species of whales have been identified in the Galapagos, but they come in two very distinct types: baleen and toothed whales (toothed whales includes dolphins, porpoises, and orcas, as well as sperm whales). Baleen whales do not have teeth, but a comb in their mouth used for filtering plankton and other small fish from the water, unlike toothed whales which mostly eat fish. The only time the Waved Albatross is not on land is from January to March, but they can be seen from April to December on the Española Island, where they always return during the breeding season. Nearly the entire population of 25,000 to 30,000 birds returns to Española during this period, and a lot of visitors describe the nesting season as one of the highlights of visiting the archipelago. Waved Albatross’ mate for life, and their courtship dance can last up to 5 days, including: beak fencing, honking, bowing, swaying and more. Each pair produces one egg every year, and both birds take responsibility for incubating the egg. 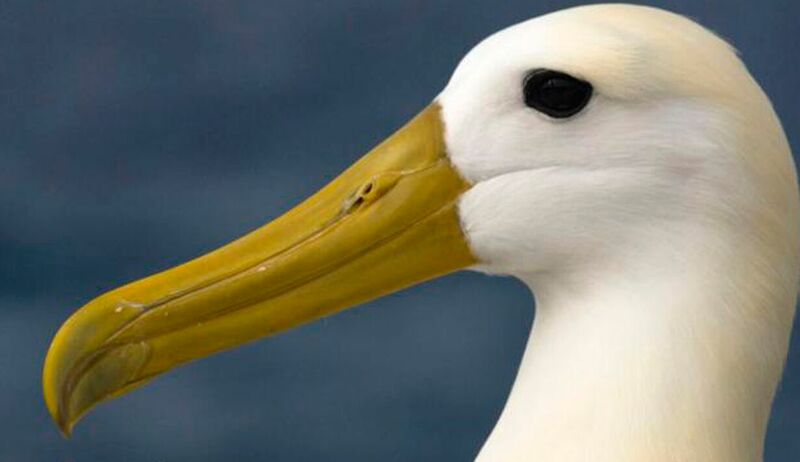 The waved albatross is the largest bird in the Galapagos, but they are critically endangered thanks to the activities of man, and man-related fishing. Long-line fishing boats lay out hundreds of miles of baited hooks which attract the birds, who get hooked and dragged under the waves. Other threats include water pollution, oil slicks, and chemicals. Not only this, but intentional harvesting for human consumption and feathers has seen a dramatic increase in recent years. Most of the 13 major and 7 smaller islands remain uninhabited to this day, and over 97% of the land is preserved as a national park, so its unsurprising that the Galapagos Islands are home to some of the highest levels of endemism that can be found anywhere on the planet. 80% of the land birds, 97% of the reptiles and land mammals, and more than 30% of the plants you see on your visit can only be found here. It’s quite literally a once in a lifetime opportunity to see the natural wonders of the island. One of the most popular birds to see is the blue footed booby (aptly named for their blue feet) who typically feed close to the shore, making spectacular dives into the sea to catch fish, and their elaborate mating ritual includes a stamping feet dance and a pose known as “skypointing”. Like flamingos, their feet are blue due to the nature of their diet which is high in carotenoid pigments, and it has typically been observed that males with brighter feet do better in mating rituals. Another popular bird is the flightless cormorant, which ranks among the world’s rarest bird species with less than 1000 left in the Galapagos Islands. These birds have black and brown feathers, turquoise eyes, growling voices, and wings about 1/3 the size that would typically be required to fly. They’re found only on the Fernandina and Isabela Islands, where they are often found diving in search of fish, eels, and other small prey. There is also the Red-Lipped Batfish, with unusual red lips and an ability to “walk” along the ocean floor, the Galapagos dove which performs a unique bee-like function, helping to pollinate the Opuntia Cactus they use for food, and the Galapagos penguins which are only 19 inches long, and have genetically adapted to the heat: they regulate their body temperature by stretching out their flippers, avoiding the sun, panting, and swimming in the islands’ cool waters. And let’s not forget the famous Galapagos tortoise, which can live for over 250 years and were a key influence on Darwin’s Theory of Evolution: tortoises from different islands varied greatly in size and appearance, suggesting genetic adaptations to their environments. 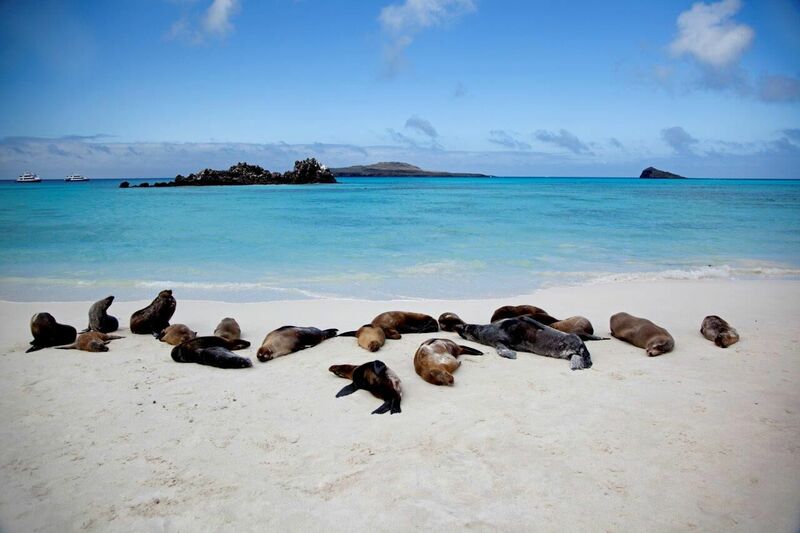 Santa Cruz island: Santa Cruz is the economic centre of the Galapagos, and the most populated island. As it’s the second largest island, there is plenty to see, such as the Los Gemelos (two craters that formed with the collapse of a magma chamber), Puerto Ayora (the main town, which houses the Galapgos National Tourism offices, and where the famous Galapagos tortoise rests), as well as the Princes Ranch and El Chato Tortoise Reserve. Isabela island: formed by six volcanoes, and resting directly on the equator, Isabela is known as the largest of all the islands. It’s a great destination to see a lot of flora and fauna unique to this particular island due to the newer lava fields, and today it is home to 2,200 residents who make their living from fishing, agriculture, and tourism. Floreana Island: once used as a penal colony, and inhabited by pirates and whalers in the 1600s, the natural wildlife has all but been wiped out thanks to the introduction of non-native seeds and animals. However, that doesn’t detract from the island’s natural beauty; Cormorant Point has a few beaches to relax among the bright pink flamingos, where you might also spot dolphins swimming in the water. San Cristobal: with a small town, airport, and military base, San Cristobal is one of the more built up islands, but it is still a naturally beauitiful destination. Travellers have the chance to swim around the white coral beach, and try their hand at bird watching – the Chatham mockingbird and the San Cristobal lava lizard are unique to this island, so watch out for them. Or take a wander over to Lobos Island, home to sea wolves, seals, and small birds. Espanola: the oldest island, and one of the best places to experience wildlife, Espanola Island is the only place in the world where the native albatross’ make their nests. Santa Fe: one of the oldest islands in the Galapagos, there is always something to see on Santa Fe, from walking the trails of the Opuntia Cactus Forest to spotting manta rays, sea turtles, sea lions, and giant iguanas lounging on the beaches and rocks. Baltra: once a US Army Air Force base during World War II, today you will find yourselves in the middle of a Galapagos Land Iguana sanctuary, where the Galapagos Conservatory are trying to re-introduce the iguanas. Sea lions and birds are often spotted here as well, and for historical reasons alone it is a fantastic place to visit. North Seymour: barely 100 metres from Baltra, due to its very brushy vegetation, bird watchers will be delighted to spot one of the largest populations of blue-footed boobies, swallow-tailed gulls, and frigate birds. Bartolome: one of the youngest islands, and often the most photographed thanks to its colourful rock formations. Swimming and snorkelling around Pinnacle Rock is one of the main attractions as you’re likely to spot penguins, green turtles, tropical fish, and reef sharks. Santiago: for those interested in geology, Santiago island is the place to see. 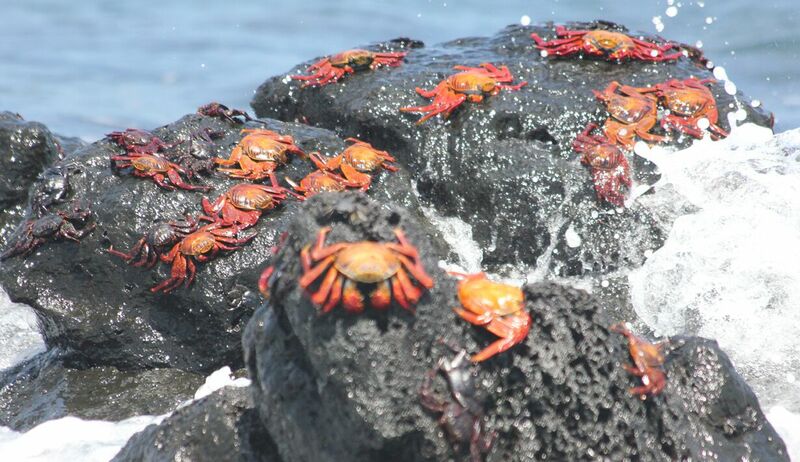 Formed as the result of two overlapping volcanoes, the lava rock creates tide pools full of crabs, and you can observe lava flow in Sullivan Bay. Rabida: famous for its red sandy beaches, Rabida Island is perfect for the ‘gram. Pink flamingos enjoy the saltwater lagoon, while brown pelicans nest in the salt bush and marine iguanas and sea lions lounge along the beach. Fernandina: the smallest island, Fernandina has only one tourist site, and is typically considered the most pristine island in the archipelago. Due to the cold waters, the flightless cormorants and Galapagos penguins tend to make an appearance, and the only site available to tourists is Punta Espinosa, which consists of a small trek around the peninsula. Visiting all these islands completely on your own obviously poses a challenge just because of the sheer number of places to visit and things to see. A lot of travellers opt to tour the Galapagos Islands as part of a cruise holiday, either a more personal one or as part of a wider group. Doing it this way means travellers can still experience the natural beauty of the islands and their wildlife, without the added stress of planning such an extensive trip. There are two airports in mainland Ecuador (Quito or Guayaquil) that offer flights to the Galapagos Islands, and you can fly into either the San Cristobal airport or Isla Baltra airport. Most travellers find it easier to fly into one airport and out of the other, due to the nature of most tours starting at one airport and ending at the other. Due to its scientific significance, 97% of the islands have been declared a national park, which means that these areas are uninhabited by people, and the Galapagos National Park charges an entrance fee. Of the remaining 3%, there are roughly 25,000 people residing here. The islands are a hotspot for volcanic activity, and there has been 13 volcanic eruptions over the last 100 years. 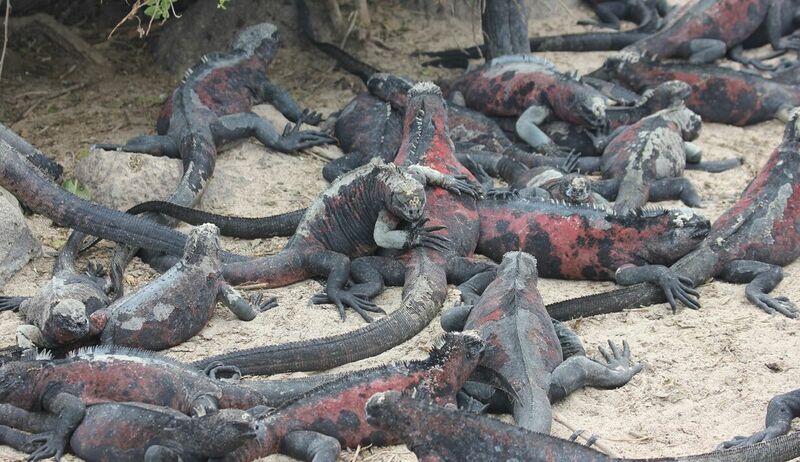 The most recent eruption was in May 2015, which sparked concerns about the endemic species of pink iguanas that reside on Isabela Island. Because of the islands’ tropical location, there is no need for daylight savings, so the days and nights are completely equal in length. All year round there will be 12 hours of daylight, and 12 hours of night, so you’ll have plenty of chances to see the diurnal and nocturnal animals. The Galapagos tortoise has the average lifespan of well over a century, making it one of the longest-living vertebrates on the planet. The Galapagos Islands are an archipelago of volcanic islands distributed around the equator, and 97% of the land mass that makes up these islands is designated as a national park. They are a must-see location for anyone, but particularly those interested in the wildlife adventure and wish to see a variety of bird and animal species that are unique to the islands. There are over 20 islands to visit, all of which are known for different specific scenery, vegetation, and wildlife, although much of the more common species can be found across multiple locations. The islands were made famous by Charles Darwin, who visited in the 1800s on the HMS Beagle and studied the wildlife of the ‘Enchanted Isles’, which ultimately led him to come up with the theory of evolution by natural selection in 1859. In his theory, he noted that each island had its own species of tortoises, reptiles, finches, and other birds, all of which had adapted themselves to suit their unique island environments. Although some species have descended from a common ancestry, there are some – like the blue-footed boobies – that are found nowhere else in the world. 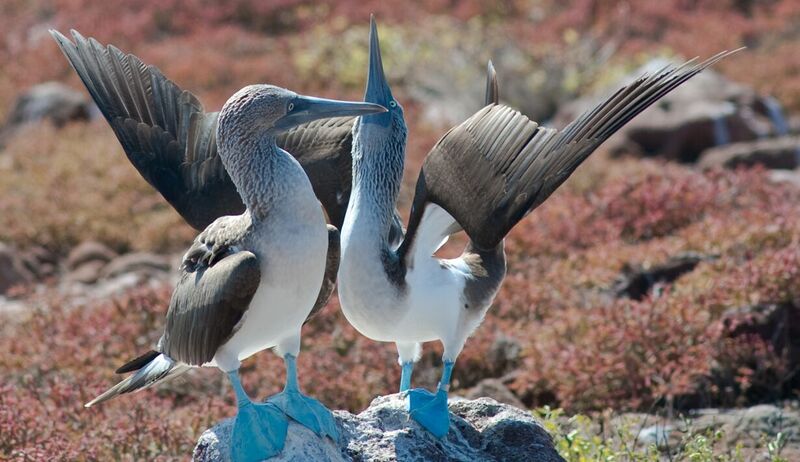 Check out all our Galapagos trips here.